The 1966 Topps Football card set is one that easily gets lost in the shuffle of other sets from the decade. Comprised of 132 standard-sized cards measuring 2-1/2 by 3-1/2 inches, there are very few rookie cards included in the set. The best-known are Jim Turner (#103), Otis Taylor (#75) and Wendell Hayes (#34). This was the third straight year where only players from the AFL were included in Topps' annual football offering. 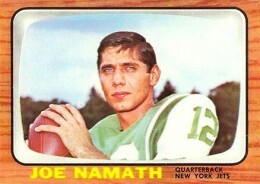 Key veterans in the set include: Joe Namath (#96), Jack Kemp (#26), Len Dawson (#67) and George Blanda (#48). 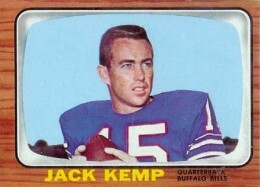 The design of the 1966 Topps Football card set was fitting as this was the same year all three major television networks transitioned to standardized color TV broadcasts. Featuring a horizontal orientation, the card fronts were designed to resemble a color console TV with a wooden cabinet. It wasn't exactly new, as Bowman featured it on its 1955 baseball set and Topps used a similar design for its 1961 football highlights cards. The player picture appears to be surrounded by a picture tube that mimics the rounded shape of a TV screen from the era. The brown wood border runs around the card and contains the player's name, team and position at the bottom of the card. 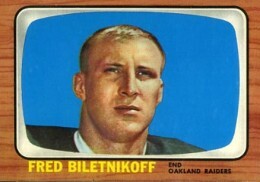 On the reverse side, a white box in the upper left corner contains a card number and a team logo. To the right of that, the player's name, team, position and vital stats appear. A short biographical write-up is displayed below that, and then a cartoon that explains a highlight of that player's career. For some players, an area for year and lifetime statistics appears below the cartoon. The cards are numbered so each team is grouped together. The teams are arranged alphabetically by city name, and each player is arranged alphabetically by last name. The set also includes the first cards of the Miami Dolphins, who joined the AFL as an expansion team that year. There are three checklist cards. Two list the cards in the set, while the other lists all the different Funny Rings that were included as inserts in that year's wax packs. 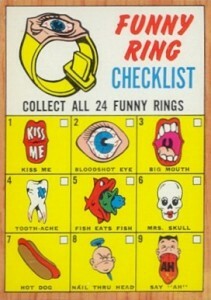 As always, the checklists are tougher to find unmarked, but the Funny Rings checklist can be nearly impossible to find in any condition because many kids in 1966 simply tossed it away. Due to the brown borders, the cards show edge and corner wear very easily. As a result, cards from the set are hard to find in top condition. The other significant condition issue common to the 1996 Topps Football card set is centering, top-to-bottom. 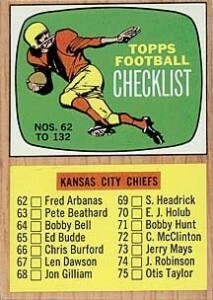 Because of the relatively small size of the checklist, there are no short-printed cards. The entire set was printed on a single 132-card sheet and distributed in a single series. The cards were available in 5c wax packs and cello packs. Despite the set's lack of big name rookies, it remains popular with vintage collectors simply due to the fact that cards can be so difficult to find in higher-grade condition. As a result, the value of the chase, in this circumstance, often exceeds the sets actual overall worth. 1966 Topps #1 Tommy Addison BVG Original Boston Patriot! 1st Card In SET! USC !! 1966 Topps #91 Sam DeLuca BVG 5.5 EX+! New York Jets! Great cards and a very under rated set!! No major rookies but the set has the second year Joe Namath card. TV borders are interesting and work quite well although the pictures are horizontal. Nice photography makes this a winner.